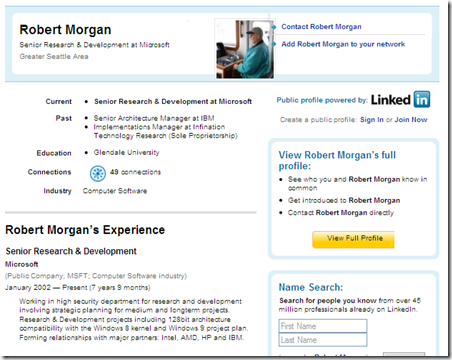 In just another one of many leaks of information that have happened over the past few years a Microsoft Programmer put just a little to much information about his job functions on his LinkedIn profile it appears. 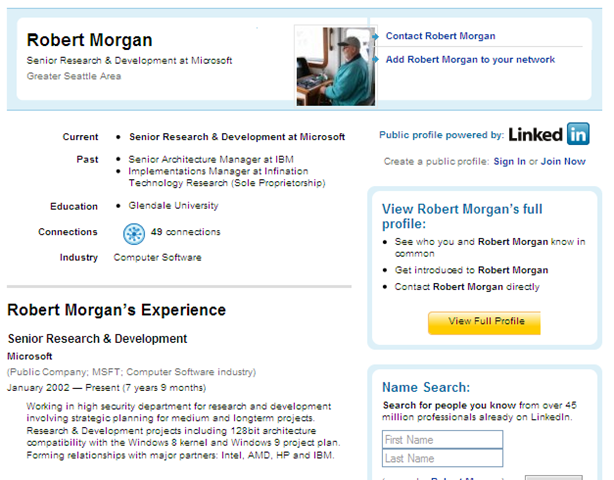 From what Robert Morgan included in his profile we know Microsoft is already working on it’s future releases Windows 8 and Windows 9. It’s probably no big deal to know that Microsoft is looking to the future but he goes on to say he is specifically working on 128bit architecture compatibility with the Windows 8 kernel. That was just a bit to much for Microsoft it appears as the profile is now gone but thanks to Google cache nothing is gone on the Internet. Do you want to join the team that is bringing virtualization into the mainstream? In Windows 7, our team will be responsible for creating, mounting, performing I/O on, and dismounting VHDs (virtual hard disks) natively. Imagine being able to mount a VHD on any Windows machine, do some offline servicing and then boot from that same VHD. Or perhaps, taking an existing VHD you currently use within Virtual Server and boost performance by booting natively from it. Of course my favorite was when Microsoft Partner Lead in Sweden blogged the upcoming Windows 7 release dates which was taken down within an hour of posting. We also had screen shots of Windows 7 builds posted by Microsoft on various Microsoft blogs showing internal build numbers well ahead of any Beta release builds. So the take away from this is one even as we still can’t get Microsoft to email US Partners 64bit Windows 7 disk instead of 32bit it’s clear Microsoft is moving ahead with a 128bit OS. Second Microsoft already has a kernel or core OS it’s working on for Windows 8. Lastly and the biggest take away is to remember when your putting in that profile information or sending out a Twitter post double check what your putting down really should be public information. This entry was posted on Saturday, October 10th, 2009 at 8:16 pm and is filed under Technology. You can follow any responses to this entry through the RSS 2.0 feed. You can leave a response, or trackback from your own site.